Intel’s Thunderbolt press conference at Computex was an embarrassment of riches, only without the riches. Lets just say I pity the spokesperson who is tasked with selling this turkey, the pitch isn’t getting any more believable. The short story was Intel put out a host of cables, devices, motherboards, and laptops, all with Thunderbolt. The only problem is that there were a lot of cables, fewer devices, and the laptop/mobo count was laughable. Even the devices were pretty slim, Intel had to put out one of each color for some models to fill the ‘wall’ of devices. There were a few mildly interesting bits, but mostly it was painful to see. The key messages of the show were rather dubious once you actually asked questions. For example, the cables are currently available in copper, Light Peak, aka Thunderbolt, can’t actually do the light part, it doesn’t work. At Computex, Intel announced that they now have optical cables, the light is back in Light Peak. Steve Jobs can’t call it Dark Bolt any more for more several reasons. 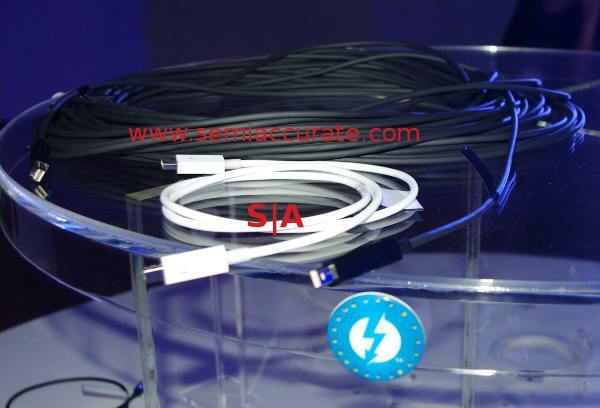 These new optical cables extend the range from the current .1-3M to 10-20M. This is a good thing, right? Yes and no, but mostly no. Yes because it does deliver more cable length. No because it isn’t actually optical like Intel promised and showed off, that simply failed, you will never see the optical version of Light Peak/Thunderbolt. Instead, you get an active cable, basically a copper Thunderbolt cable with an electrical to optical converter in the end, Intel is faking it, and the press is not technical enough to believe the line of bull they are being fed. Sad. Cables that cost more than the board they go into. That said, Intel is promising that the cables, currently shatteringly expensive, will come down in price by the end of the year. If you think the current $40-50 cables are highway robbery, help is on the way. Until you ask them to quantify that claim. If Intel’s projections are right, the cable price will drop by 25%, so $30-35. Compare this to a <$2 USB3 cable, available now, everywhere, for less than a tenth of what Intel hopes Thunderbolt cables will get to this year. Maybe. Please believe them, they tried so hard to say it with a straight face that they deserve at least a little disingenuous praise. That however is for the copper cable. The optical one is the expensive part of the copper version, plus some even more expensive optical converters. If you think the current cables are expensive, Intel Capital is here to help, offering generous finance terms for 20+ year loans if you want to buy an optical Thunderbolt cable. At least you won’t have to worry about it providing power to the device, that goes bye-bye once you go optical. ‘Optical’ Thunderbolt was a good idea, what we get is a joke. Then it got better. 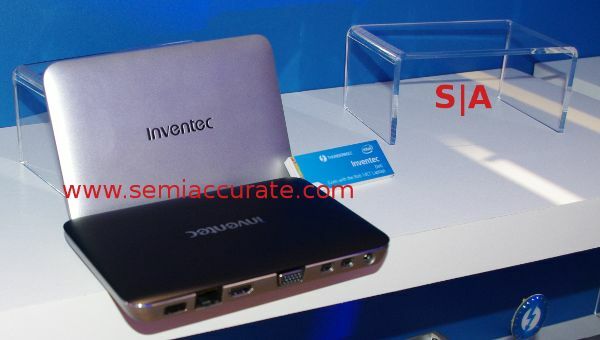 Intel is promising that you will maybe have working drivers for PC Thunderbolt soon. The fact that they aren’t out by now is laughable by itself, and the less said about Intel’s driver woes the better. Suffice it to say that you should probably not count on functional drivers from Intel for anything critical. Ever. Then comes another problem, Thunderbolt is a dumb PCIe funnel, it currently acts as a transparent bridge for 4 PCIe2 lanes _OR_ video traffic, you can’t do 4x PCIe2 AND video. If you plug a device in to the other end, you are essentially hot plugging a PCIe card in to the system. If you are on Windows, this has the effect of putting on BSOD colored glasses. SemiAccurate has heard that Microsoft changed the BSOD to a different color in Windows 7, but since we don’t run it, we can’t say first hand. That said, if you are playing with Thunderbolt, expect more colored screens than a fleet of Carnival floats. If you are lucky enough to get it to work without crashing, then there is another problem, your machine needs drivers for everything you plug in. Can you say reboot. And reboot. And reboot. And reboot. Dumb funnels have a place, but the way Intel did Thunderbolt means that if you plug in a SATA drive, you are plugging in a SATA drive and a SATA controller and a Thunderbolt chip. Three devices, only one of which Windows tends to be aware of natively. Talk about driver hell. This problem is compounded by another Thunderbolt stupidity, anything you have on the PC like USB3 ports, SATA, and whatnot, can not be passed over Thunderbolt. You have to put another controller on the far side of the cable, duplicating functionality and adding power draw. You need to add a new controller for everything you want to plug in, and install drivers too. That brings us back to expense. Thunderbolt chips are painfully expensive, $20 BoM cost for the cheaper ones, basically double that for end user price adders. To make a Thunderbolt external drive, instead of a $3 USB to SATA bridge, available everywhere now in volume, you take the case, add a $20 chip, a full PCIe SATA controller, and pray Intel doesn’t pull your allocation for some nebulous reason like you are selling things to AMD. For USB3 drives, you end up with a $6-7 end user cost, plus the case itself. For Thunderbolt, you are at $20 + $10 BoM, doubled for end users, plus case cost. You may pay more, but it is incompatible with just about every consumer electronics device ever made, USB can’t make the same claim. Notice we took a shot at Intel for pulling allocation. Why? Because ONLY Intel supplies Thunderbolt chips. No one else makes them, not because there is no market and you would have to be an abject idiot to design for this technological folly, but because Intel won’t let you make them. Intel, despite their vagaries when asked, has no plans to let anyone else make Thunderbolt chips. Ever. It is a complete lock-in for consumers, worse than the Apple iWidget connector, that is at least licensable, Thunderbolt is a direct monopolistic power grab. Could it get worse? Sure. Remember that Thunderbolt can pass video signals, so the Thunderbolt monitors are probably pretty high end, right? Actually, Intel didn’t show any Thunderbolt monitors at the press conference because, other than the Apple one, there are none. At Computex, the count of non-Apple Thunderbolt monitors SemiAccurate found on the show floor was a grand total of zero, and we did look for them. Why aren’t manufacturers rushing in to this debacle? Because if you make a Thunderbolt monitor, contrary to what Intel was trying to intone at the press conference, you can’t use it with DVI, Displayport, VGA, or any other standard, it is Thunderbolt only. This wonderful monitor connector has no monitors to connect it to unless there is a fruit on the back. We won’t point out that Thunderbolt does not have enough bandwidth to pass a Displayport 1.2 signal over, that would be mean. Instead, we will just congratulate Intel for finally noticing that Thunderbolt was 10Gbps, not 20Gbps like they have been saying at previous press conferences. This deserves a pat on the back. Barely. 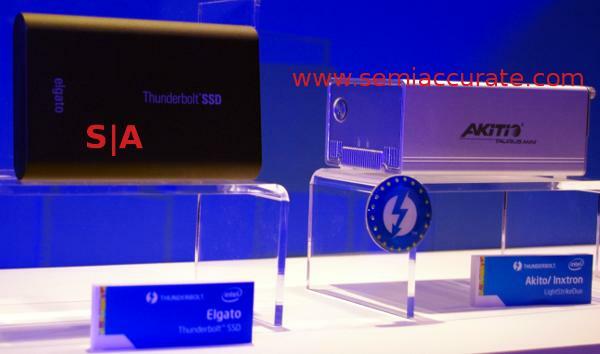 If we sound negative on the prospects of Thunderbolt, there is one bright light, external drives, SSDs in particular. Thunderbolt can provide about 66% more bandwidth than a SATA connection, so if you have an external SSD, it will absolutely fly, right? Yes it will. Unfortunately, the drive itself is a SATA drive over the Thunderbolt bridge, so it actually won’t deliver any more performance than a SATA drive. Luckily there are dual drive external cases like the Akito one pictured above. Connected over Thunderbolt, it will allow you to get, err, a bit less bandwidth than the drives raided on your PC, 10Gbps over Thunderbolt, 12Gbps over two SATA channels. At least you won’t have to worry about an external power brick with these. Unless you use the optical cable, that doesn’t provide power, and the Thunderbolt SSDs shown had no provision for external power. Whoops. All in all, Intel’s Thunderbolt press conference was a joke. The device count was slim even when counting color variants and model differences in boards that were minor at best. The categories of devices was painfully narrow, and prices, when actually available, were absurdly high. That is in no small part due to the prices Intel charges for its monopoly Thunderbolt chip.